WASHINGTON -- U.S. Rep. John Conyers -- beset with allegations of sexual harassment by former staff members -- announced Tuesday that he is retiring. "I'm in the process of putting my retirement plans together," he said from a hospital. "I am retiring today." John Conyers' attorney, Arnold Reed, has said Conyers' health would be the paramount consideration in whether he decides to step down from his House seat. He has already stepped aside from his position as ranking member of the House Foreign Affairs Committee. Bloom posted Grubbs' affidavit on Twitter and confirmed to The Associated Press that it was genuine. Grubbs' affidavit says that she worked for Conyers in various roles from approximately 2001 to about 2013. "Rep. Conyers slid his hand up my skirt and rubbed my thighs while I was sitting next to him in the front row of a church," Grubbs said. "I was startled and sprang to my feet and exclaimed, 'He just ran his hand up my thigh!' Other staffers witnessed the event." She also said that she saw Conyers touching and stroking the legs and buttocks of Brown and other female staffers on "multiple occasions." Grubbs said witnessing such harassment "was a regular part of life while working in the office of Rep. 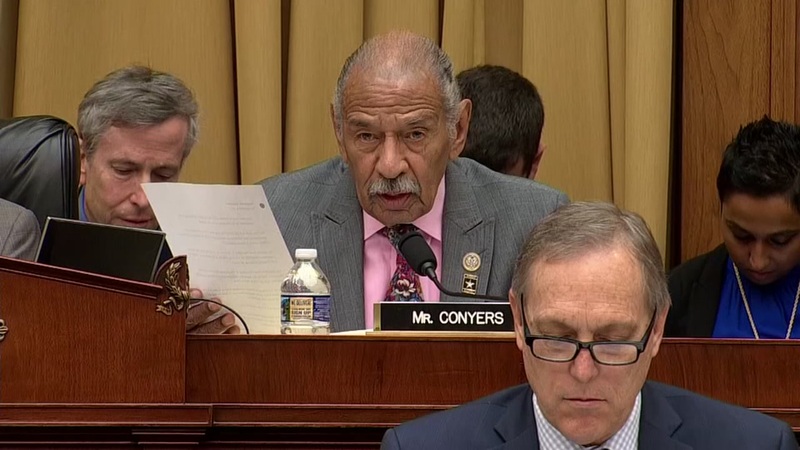 Conyers." Reed told the Detroit Free Press that the allegations by Grubbs are "another instance of tomfoolery from the mouth of Harvey Weinstein's attorney." Bloom previously represented Hollywood executive Weinstein, who is accused of sexual misconduct by a number of women. She quit Weinstein's team after the allegations became public and now represents sexual harassment victims.